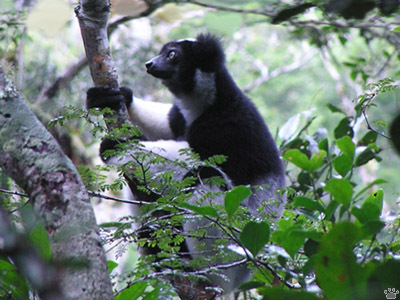 Indri lemur (Indri indri), Parc National Andasibe-Mantadia, Madagascar. For a biologist, Madagascar is not a big island - it is a small continent, full of wonderful plants and animals found nowhere else on Earth. 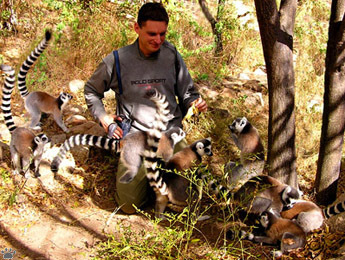 For a tourist, it's the last place where forests are still inhabited by elves, fairies and other magic creatures, collectively known simply as "lemurs". There are 40-50 species of them here, with new ones being discovered almost every year. Before the arrival of humans 1,500-2,000 years ago, there had probably been twice as many, some as large as a male gorilla. It's hard to imagine what they looked like, but I think they were very beautiful: among the surviving species, the largest ones are also the most colorful. 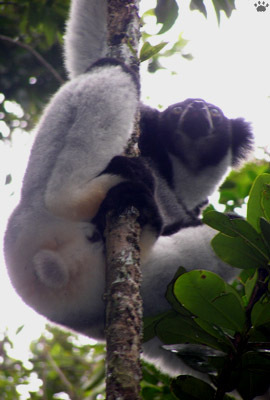 The most koala-like part of an indri is its ears. PN Andasibe-Mantadia. Indris have tails, too. PN Andasibe-Mantadia. 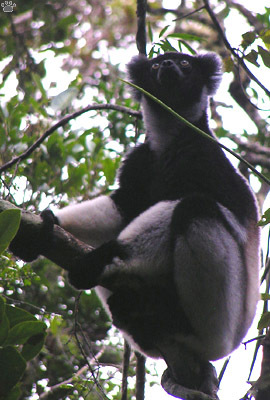 Indri is the largest surviving lemur. 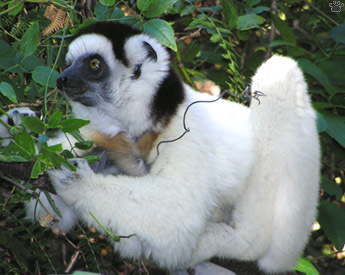 Like most of Madagascar's wildlife, it is now confined to a handful of Nature reserves. 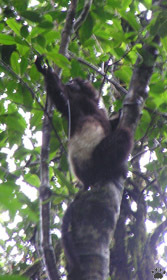 Indris are an ecological counterpart of koalas and sloths. They also feed mostly on tree leaves, but, unlike koalas, they are diurnal and live in small groups. They are surprisingly athletic and can leap from tree to tree. Groups are easy to locate by their beautiful songs, which can be heard from 3-5 km away. Indri listening to another group's songs, Andasibe-Mantadia. 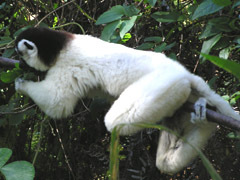 Verreaux's sifaka (Propithecus verreauxi verreauxi), Parc National L'Isalo. 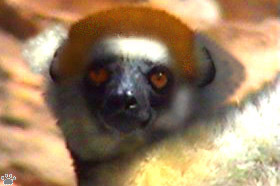 Diademed sifaka (V. diademata. diademata), PN Masoala. Parc National Marojejy. 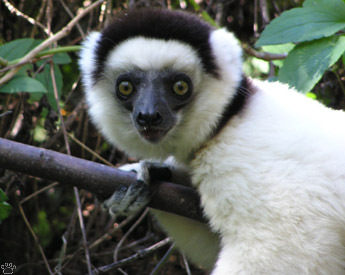 Indri's relatives, sifaka lemurs, are the most colorful mammals. There are three species and nine subspecies, from all-white to all-black. 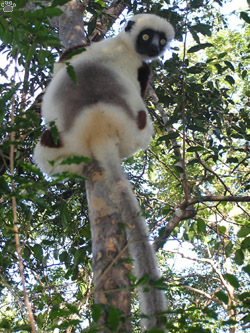 Sifakas are capable of leaps up to 15 m (50') long between trees. On the ground, they leap on their hind feet. But usually they don't move around too much. 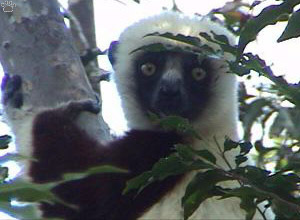 The name "sifaka" refers to one of their alarm calls. 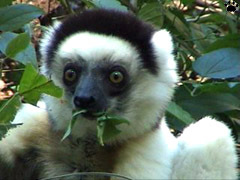 Sifaka lemurs feed mostly on leaves, but also on fruit, flowers, and sometimes tree bark. 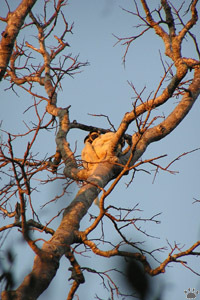 Verreaux's sifaka, PN L'Isalo. Kirindi Forest Reserve. Some sifakas are now endangered, especially Perrier's and Tattersall's, confined to tiny forest remnants in northern Madagascar. Southern races are more widespread and much easier to see. 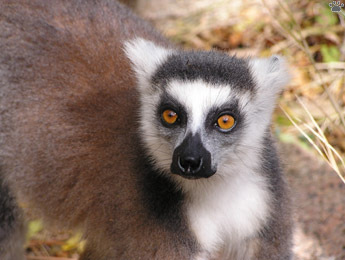 Like all lemurs, they are peaceful and gentle creatures, easily habituated to people. 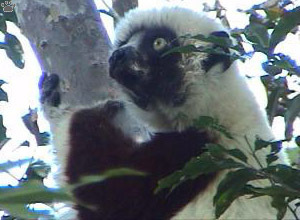 Tattersal's sifaka (P. tattersalli), Darainy Forest. 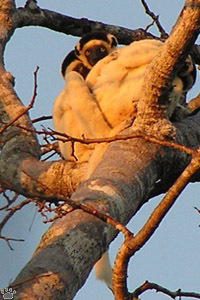 Decken's sifakas spend nights high in trees. Canyon de Maquis, Parc National L'Isalo. Sifakas can live in all types of forest: thorny forests of the island's arid southwest, permanently wet rainforests of the east, even the deep, dark canyons of Parc National L'Isalo. 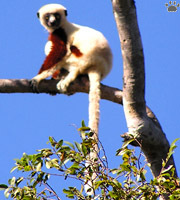 Coquerel's sifaka, PN d'Ankarafantsika. 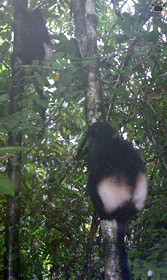 Rainforest sifakas spend a lot of time in the canopy, and can be difficult to photograph, especially in bad weather. But they are all very photogenic. 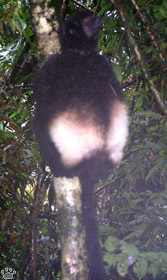 Milne-Edwards' sifaka (P. d. edwardsi) in the rain, Parc National Ranomafana. 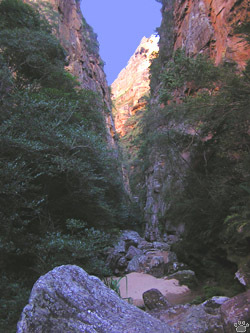 Anja Nature Reserve. Catta, or ring-tailed, lemurs are probably the ones best known outside Madagascar, because they can become tame almost instantly, and breed well in captivity. They live in dry forests of southern Madagascar. Some populations inhabit high mountains. 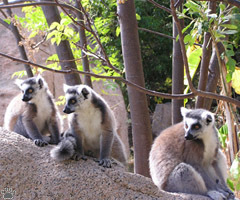 Cattas are less arboreal than other lemurs, and very social, often occurring in groups of up to 30 animals. 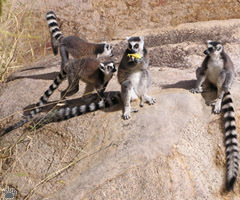 Catta lemurs, Anja Nature Reserve. 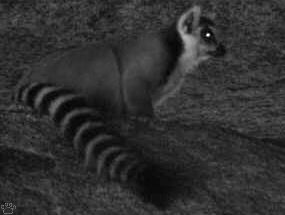 Catta lemur on a salt lick in a cave, Anja Nature Reserve. 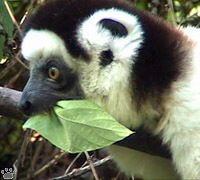 Their main food is fruit, but they also eat some leaves, flowers, and insects. They have to move around a lot to find enough food in their dry habitat. In some areas, cattas visit caves in search of mineral salts. 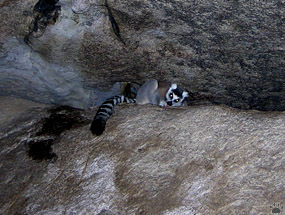 Catta lemur on a salt lick in a cave, Anja Nature Reserve. 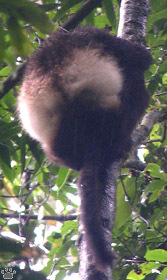 Catta lemur, Anja Nature Reserve.